It’s a unit of measure. The stone or stone weight is an English and imperial unit of mass now equal to 14 pounds (6.35029318 kg). My body weight (Earth) is approximately 11.4 stone. Stone also refers to a solid aggregate of one or more minerals or mineraloids. Rocks are stones. It may also refer — in the plural — to the assemblage of English musicians into a rock and roll band or the assemblage of pages and images into weekly periodically about music and popular culture. Was that a pun? Stone silence on that question. Wait, that was a pun? My town of Skillman in Montgomery Township lays at the base of the Sourland Mountain, a 27km long ridge extending from the Delaware River in Lambertville to the western end of Hillsborough Township, through Montgomery Township, and into Hopewell Township. The Sourland Mountain and the area around it are full of hard igneous rock called diabase. The diabase is a type of highly erosion resistant stone known as trap rock. 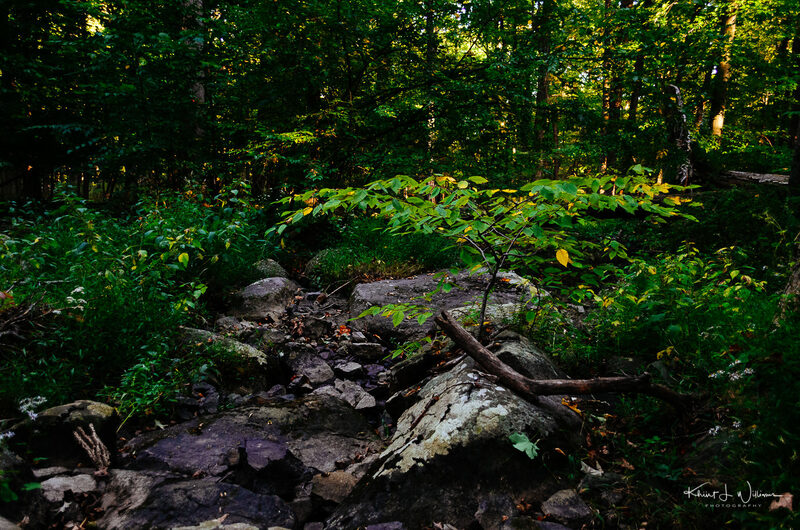 In the sixteen years that I have lived in Skillman, I have photographed many various sections of the Sourland Mountain including my favourite spot, the Rock Brook. But there are other areas that I wanted to explore for this photo challenge. 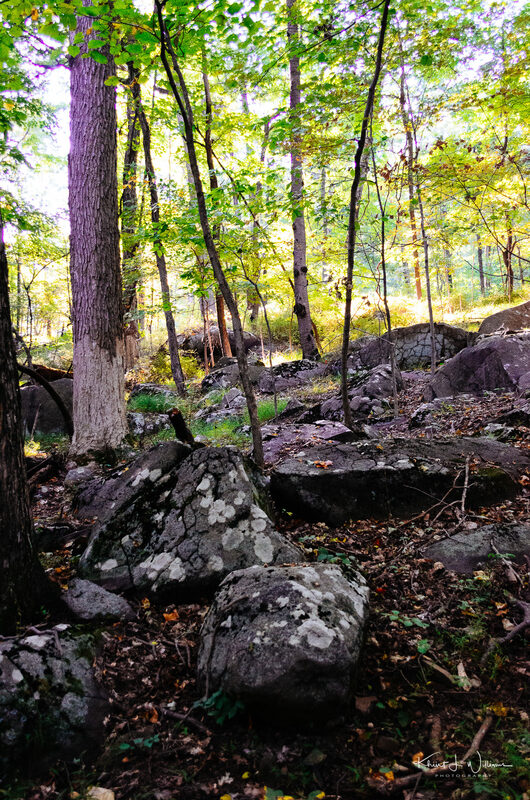 On private property along Rileyville Road in East Amwell Township, Hunterdon County, a series of three large rocks sit on top of another boulder large enough to hold them. Legend claims that many years ago three brothers decided to meet the Devil, overcome him and rid the area of his presence once and for all. But, as it turned out, they were no match for the Evil One who surprised them, turning them into stone on the spot where we still see them sitting today at Three Brothers Rock. 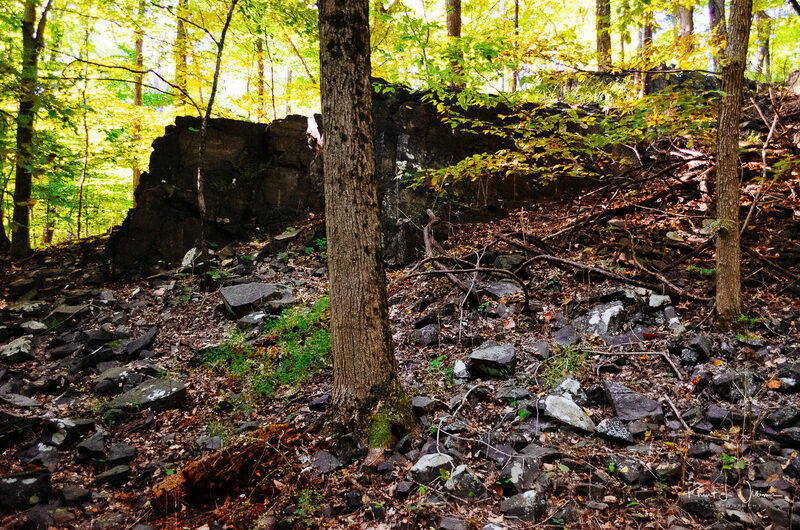 The European’s who settled the area shared a penchant for naming areas after the Devil himself, for example, the boulder fields called Devil’s Featherbed and a collection of huge boulders along the hiking trails in the Sourland Mountain Preserve called Devil’s Half Acre. Bhavna’s was tired from attending the Bruno Mars concert last night. I was hoping she’ll join me in hiking the eight-kilometer (~ 5 miles) Ridge Trail from the trailhead at Eastern Mountain Road in Hillsborough Township, along Maple Flats and up the boardwalks into Montgomery Township toward Roaring Rocks, then continue along the Roaring Brook trail over the Texas Eastern Pipeline toward Devil’s Half Acre before heading back down to the trailhead. Instead, I contacted my friend Prasanna who was happy to get out on a hike with me. We hike hikes for just over two hours. We didn’t stick to the planned route. We skipped the outbound trail to Devil’s Half-Acre and instead returned to the trailhead via the pipeline. It was just a bit too warm and humid for us. We were sweaty and sticky. And this lens is not particularly good at certain apertures. I noticed a lot of chromatic aberrations. Nice forest scenes. I like the light on the vegetation. I also like how you put the Google map in the post. I am going to have to try doing that for some of my walks. Hi Frank, thanks for the support. Google Maps been useful in planning a few of my hikes.